FRANKFURT, GermanyProviding a wider range of options to its industry-leading Vi Series digital mixing consoles, HARMAN's Soundcraft is introducing the Vi5000 and Vi7000 models at Prolight & Sound 2015. The Vi5000 and Vi7000 offer optional 96kHz processing, upgraded channel counts and even more reliable hardware to the live sound industry's most popular mixing interface. The Vi5000 and Vi7000 replace Soundcraft's popular Vi4 and Vi6 consoles, offering significant technology and feature set improvements whilst retaining and building on the user interface and sound quality characteristics that have made these consoles a favourite on riders for the last eight years. 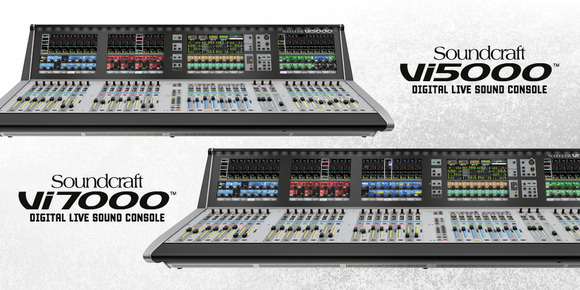 The Vi5000 and Vi7000 provide a choice of compact control surfaces with new local rack and active breakout box hardware, delivering simultaneous mixing of up to 128 inputs and 32 mono/stereo busses with up to 384 inputs and outputs in the I/O system allowing unlimited record feeds from all channels. Pristine sound quality is assured with ultra-low noise microphone amplifier designs and enhanced 96kHz 40-bit floating point digital audio processing, with the first ever digital implementation of the classic BSS DPR901ii Dynamic EQ adding to the channel processing armoury, while effects contain eight independent Lexicon multi-FX units, and a BSS graphic EQ on every bus output. Both consoles also feature an additional dedicated 64ch MADI interface for Realtime Rack; a collaboration with Universal Audio that gives users access to industry-standard UA studio plugins. Rapid configuration via new encoder assign functions and shortcut keys are joined by a new extension to the Vi's patent-applied-for VM2 radio microphone status monitoring feature, with Shure ULXD systems now recognised alongside AKG's DMS800 and WMS4500 systems. The Vi5000 and 7000 consoles boast the most configurable local and Stagebox I/O hardware in their class, with extensive ViSi Connect I/O expansion options available (EtherSound™, CobraNet™, Dante™, MADI, etc.) plus a choice of CAT5e or Optical fibre Stagebox connection to suit budget and cable length. The Vi5000 and Vi7000 also feature the latest 3D Vistonics II™ and FaderGlow™ interfaces, plus an improved ViSi Remote iPad control interface completes the package. "Our Vi4 and 6 consoles have been enormously popular with countless tour sound professionals, as well as theatres, houses of worship, and more," said Dave McKinney, Vice President and General Manager, Soundcraft and Studer. "With the introduction of the Vi5000 and Vi7000, we are showing that we've listened to our customers and are offering a significant step up with the User Interface features they need and the world-class audio quality and processing tools they expect, so that any engineer can have the very best mixing technology at their fingertips."